The Cemetery of the Holy Ghost was sprawling and composed of many parts, reflecting different eras in the history of the country. There was the very old part that contained the bones of people from so long ago that some of them had fought the British and had laid eyes on George Washington. And then, moving on to the more recent past—but still long ago—there were bones of those who had fought in the Civil War, including a famous general or two and their wives and offspring. After that, there were the rich industrialists and beer barons of the 1890s who built their elaborate mausoleums at great expense, looking like small gothic churches, to house their remains and those of their families. From there we move on to the boys who fought and died in the First World War and, farther along, the Second World War. Mixed in are some famous writers, a mistress of a president or two, a long-forgotten North Pole explorer, a famous operatic tenor, and on and on, not to mention the tens of thousands who never did anything to distinguish themselves while they were living and certainly had no plan to do so while they were dead. Somewhere between the Civil War and the Spanish-American War, one might find the grave of Reginald Maxim Winfield, known to his intimates as “Reggie.” He was born in 1886 and died in 1896 at the age of ten years, five months and eighteen days. The cause of his death doesn’t matter, except to say that he wasn’t sick more than a day or two and didn’t feel much of anything when he passed from the realm of the living to the realm of the dead. At Reggie’s graveside service, his mother, still not quite believing he was dead, moaned softly behind her veil. Just before the coffin was lowered into the earth, she bent over and, placing her arms around it as though she meant to pick it up, whispered a few words in the region close to where Reggie’s ear would be. When asked later what words she had spoken, she claimed she didn’t remember, being mollified by her grief as she was. Several lifetimes passed by, the world changed as much as it had ever changed in a hundred and more years, and Reggie’s spirit still remained in the Cemetery of the Holy Ghost; still hadn’t moved on as it should have done. Reggie was lonely, waiting behind, but only doing what he believed he had to do. Certain living people had seen Reggie’s restless spirit over the years, but those people were few and were uncertain, after the fact, of exactly what they had seen. After a couple of startling encounters (startling for Reggie), he assiduously avoided any contact with the living people who, for whatever reason, found themselves in the cemetery. He was a shy spirit, as most spirits are, and believed that nothing good—for him, anyway—would ever come of anybody who still had a beating heart. When he first laid eyes on the young girl, though, he didn’t run away as he usually did because he wasn’t sure if she was alive or, like him, dead. She was dressed in filthy rags and her skin, what could be seen of it, was caked with layers of dirt. She was so wan and pale and appeared so underfed that she was, he deduced, one of those unfortunate living people who didn’t have a home and who ended up in the Cemetery of the Holy Ghost because it was a good place to hide and also because she had no place else to go. If she wasn’t a spirit yet, she would be one soon. That’s why he felt a connection to her. The second time he saw her, he made sure she also saw him. “Have you seen my mother?” he asked. “I’ve seen you,” he said. “Why are you dressed in such funny clothes?” she asked. “I thought maybe you were a ghost, too,” he said. When she started to walk away, the boy put his hand on her arm. “What’s your name?” he asked. She went to the nearest large tree and sat down with her back to it; put her head back, closed her eyes, drew in her legs and seemed to go to sleep. He stood looking at her for a while and then moved on to continue his search for his mother. 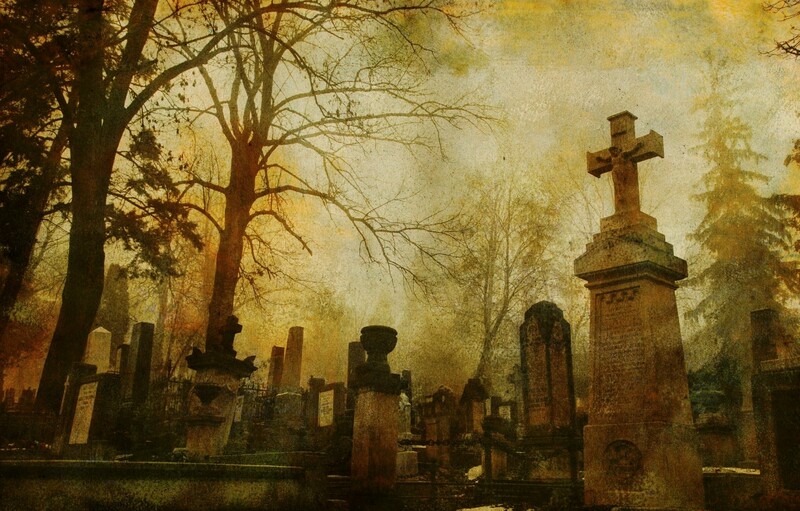 The next time he saw the girl she was sleeping in a pile of leaves between two very large gravestones. He didn’t want to wake her but as he approached he saw her eyes were open. “You look sick,” he said. He heard voices and thought someone was coming, so he ducked out of sight. A little while later when he went back to the pile of leaves between the two grave stones, the girl was gone. That night he heard the commotion of the purge, screaming and rollicking laughter, the tromping of feet over the hallowed ground. He hoped the girl had left in time and had gone to some safe place. In the morning just as the sun was coming up, he found her, bleeding and barely breathing, hiding in some bushes. One of the night watchmen had hit her in the head with his night stick and split her head open. He knelt beside her and put his face close to hers. “Why didn’t you leave when you had the chance?” he asked. “Have to get out of this place,” she said. She struggled to stand up but her arms and legs wouldn’t work. She died with the birds singing in the trees over her head. He stayed beside her and then when the end came he wasn’t too surprised to see the spirit of his mother, Dorothy Abbot Winfield, rise out of the girl’s body. She wasn’t dressed in mourning but was wearing a beautiful brown dress for autumn and looked exactly as he remembered her. She wrapped her arms around him, held him tightly and kissed his head. He took her by the hand and together they walked into the radiant light of early morning. Nothing would ever keep them apart again. Posted in Uncategorized and tagged Allen Kopp, By and By, fiction, short story. Bookmark the permalink.